SF has a force token in the spread... Spotted the mistake? The description also says it comes with six upgrade cards, but there are seven in the pic. Is this our first opportunity to launch a mine forward (not just a bomb, any "device")? N-1 looks like its gonna be everywhere. Free evades = juking dominance. Looks like im only getting the resistance transport. Nice Lambda ish support I hope. New paint job also way better, IMHO. They look nicer when they're not so monochromatic. The plastic range ruler/movement tool pack does not impress me at all. The acrylics you can buy from third parties look so much nicer. I get it, but I'm sure it'd look a lot better if painted than unpainted. Some washes and drybrushing, and the textures would pop. Now, I don't know if it'd really be my personal style, but it seems potentially cool. With the N1 available, I only need the Eta-2 to focus on a new faction! The Hyena comes with Traj. Sim., so the Bombardment Drone will probably be able to launch mines 5 straight then, right? Nope. It can't drop them with a 5 straight, so it can't launch them with one either. You can only launch mines with the same template you use to drop them normally. Not necessarily. The Hyena lets you launch using the same template used to drop, and there's currently no way to drop with a 5 straight template. Only 2 red dice, though. Hrm. Interesting ship. A Z-95 with Full Throttle. Price for that, with the solid action bar, is what, low-to-mid 30s on a cheap generic? At least if feels kinda new. Weak statline, strong ability, solid dial and action bar. Sensor slot could be fun. 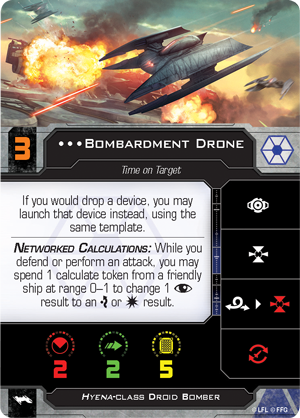 If you are a Naboo Royal N-1 Starfighter, each friendly  may spend 1 evade token to add one evade result instead"
Nice to see FFG deliver Afterburners through so many packs. Esentially an Ion Bomb on steroids. 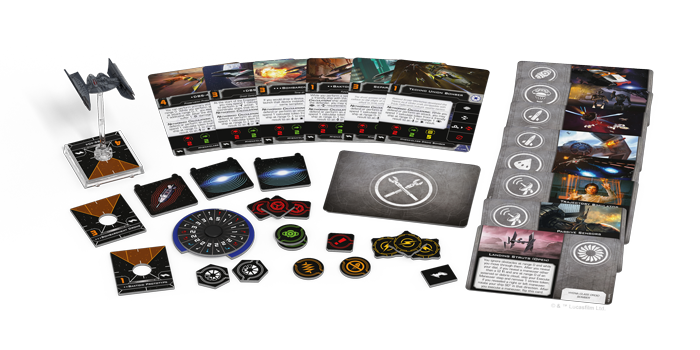 FFG will release "pilot upgrade packs" with the base and pilot cards, maybe some upgrade cards. That'd what I am thinking. They said they would do card packs, so I could see Rebel, Imperial and Scum packs similar to the Clone Wars boxes, but potentially without ships. Alternatively, they could come as part of a campaign box. That B-wing model screams "Prototype B6 repaint". Gonna have to get at least one for that. Interesting that it comes in a droid bomber and not a Republic one. Maybe this is an indication the next wave will have the Republic Y-wing which will also carry this bomb. Yey! I'm happy! Of my big 3 wish list ships, we got 2 so far: Auzituck and the Transport... Last one is the HH-87 Starhopper. I wanted the Transport since TFA. I was really hoping it would have 3 configurations (one with the pod and cannon attached, without the cargo/passenger compartment) but I'm cool with it. No. Seps can just have 2 doing it instead of only 1. Well, there are what look like Autoblaster Cannons and Plasma Torpedoes in other expansions, which might be handy for B-Wings. The N-1 looks like it might have a new System upgrade, too (whatever that recurring charge thing is). New upgrades--even when non-specific--can breathe new life into old designs. What little can be seen of the Plasma Torps looks interesting to me: they seem to have 3 rather than 4 red dice, which is new for a Torpedo. But what is the "best" way for us to get those new cards? New B-wing sculpt? Shut up and take my money. Going to be hard to only buy 2. Pack all the new stuff in there and I'm happy. But I don't want to buy an 8th Kihraxz when they come out to get a new title etc. I'm afraid FFG is building this airplane while they fly it and I'm real curious how they plan on getting new content to players that only fly OT ships. Agreed. Those are very underwhelming. Yep. The upgrades should have been in both kinds of kits. The biggest reason I'm interested in Clone Wars content is so that I don't have to rebuy B-Wings, for example. But there are other players with other desires, who'd rather buy the B-Wing, get the generic Torpedoes and Cannons and Sensors and such.